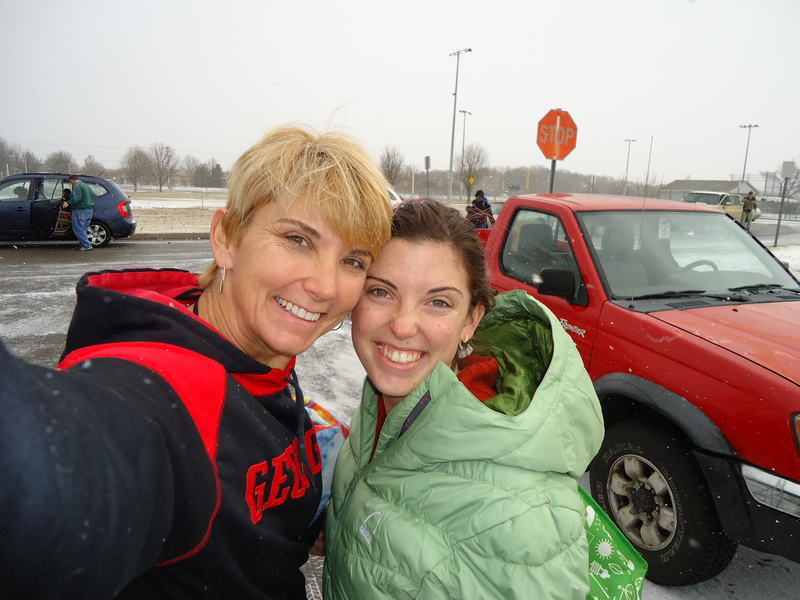 Polar Bear Plunge 2011 – Happy. Healthy. Heathen. Ahhhh, now I don’t have to think about it again til next January. 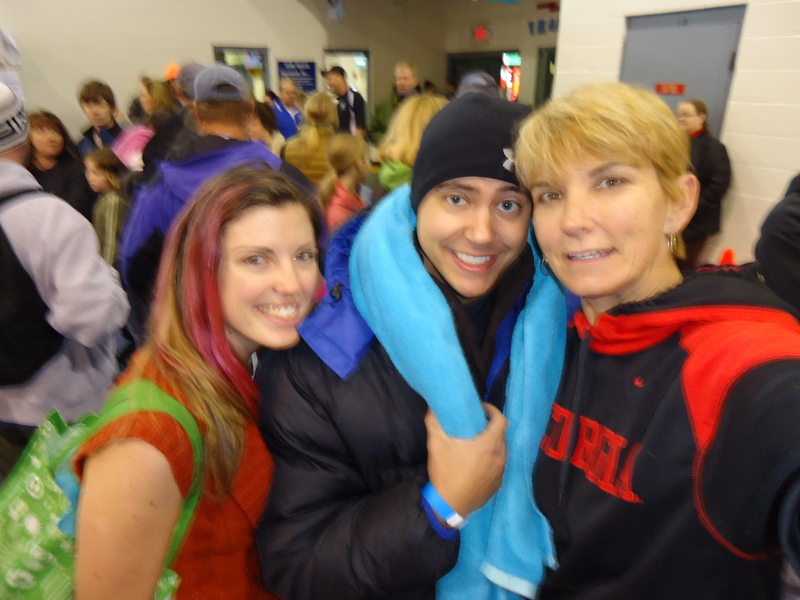 Today was the 9th annual Murfreesboro Polar Bear Plunge. Amy and I started doing this when she was in middle school, and except for last year, when we were in Colorado with the family for Christmas, we haven’t missed a Plunge. We have had a narrow range of weather, typical for Middle Tennessee, but I do believe today was a first. It was about 28 degrees, snowing, and windy. Water temp was about 38 degrees, I heard, but that’s about normal. It’s kind of a love-hate thing we have with this event. Never have we ever regretted having done it, but it’s awfully hard to get out of a warm bed on a cold, blowy, snowy morning to put on a swimsuit knowing you’re going to plunge into icy waters! The plunge itself is a feeling like no other. In the early years, there were 25 or so jumpers; I bet this year there were upwards of 300-400. After some festivities in the gym, we go en masse out to the pool and line the perimeter. Murfreesboro has redone the outdoor pool, so there was a lot more perimeter this year, and we had to re-establish our “leaping spot”. We absolutely had to jump into the deep end, because if immersion is the goal, and it is, there is almost NO possibility of my dunking my head under in an additional motion after having jumped in. It’s full immersion or nothing, as far as I see it. My friend Bernie Steen called this event Mass Baptism, so I guess the debate could rage on parallel to the religious world about sprinkling or immersion. Over the years I have tried to focus specifically on the moments following the leap, because invariably I cannot remember getting out of the pool. This year I have a little stronger memory of it. My friend Michael thinks that the cold air temperature made the water feel less drastic – he was already numb by the time we hit the water – maybe he’s right. 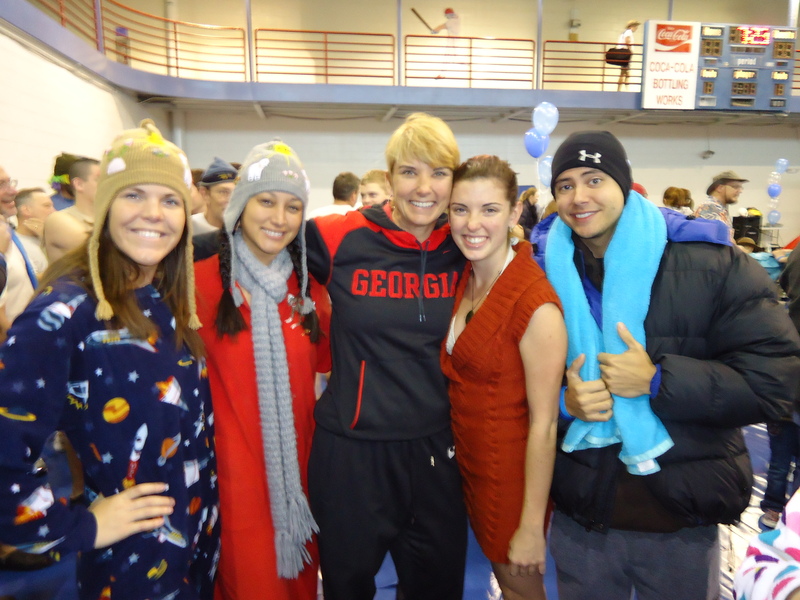 I need to say a final word about our support posse: Megan and Emily did a valiant job of TRYING to Plunge. They dressed in costume, they got to the gym on time, they registered and even had on their registration bracelets, but they just couldn’t bring themselves to hurl their tender bodies into the soup. However, they did a fabulous job of cheering us on and even digitally recording our leap, AND they made a commitment to try again next year – you just can’t ask for more than that! Oh yes, they’re wearing onesies. Brrr! I’m cold now just from having read your blog. I am so proud of you, though. I think it takes such courage to jump. Kind of like making that long climb to the top of the ladder to jump from the diving board, only to discover that getting there was all you could really do. You’re a jumper…I’m a climber. Interesting, don’t you think? I love you. Me. I’m trying to decide if there’s any bribe that would convince me to do that.